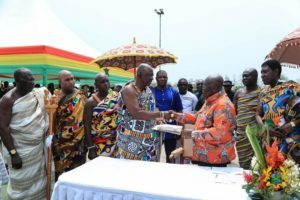 President Nana Addo Dankwa Akufo-Addo, on Wednesday, named Techiman as the capital of the newly created Bono East Region, with the assurance that government projects and structures would be equitably spread within the region. Making the announcement at the Forecourt of the Jubilee House in Accra, where he presented the Constitutional Instrument (CI113) establishing the Bono East region to the head of delegation from the area, Paramount Chief of Yeji, Nana Pemapem Yaw kabrese v, the President said the move ends years of agitation for the creation of the region. President Akufo-Addo noted that many of the reasons that necessitated the creation of the region were not peculiar to the Bono East, saying the creation of the six new regions presented the country with an opportunity to serve better the needs of the people through the effective reorganization and distribution of public services and infrastructure. He assured that government would ensure the smooth take off and development of the region, and appealed to the people from the area to support government’s efforts to bring development to the area. “This is the day we begin to write the story of growth and accelerated development of the Bono East region…this can only happen if we work together and eschew all forms of narrow parochial interest. “I am confident that the development of Bono East would contribute to the making of the great nation of Ghana that we all desire…let us be up and doing,” the President charged. 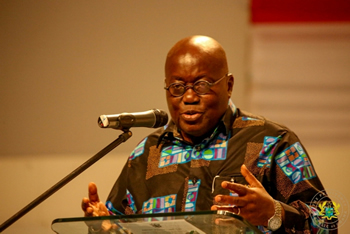 The President tasked the Brong Ahafo Regional Minister, Evans Opoku Bobie to administer the region until a substantive Minister was appointed. Pemapem Yaw Kabrese, who is also the President of the Brong Ahafo Regional House of Chiefs, conveyed the gratitude of the chiefs and people of the Bono East region to President Akufo-Addo for honouring his promise to create the region. “Your Excellency, you have been faithful to the chiefs and people of Bono east and this gives us confidence and assurance that the new region would see massive development and improvement in the lives of our people,” he said. The Yeji Paramount Chief noted the enormous potential of the new region, and said, it should be harnessed for the benefits of the country.